MagPlex-TAG™ Microspheres are oligonucleotide-coupled polystyrene microparticles, or “beads,” that have been dyed into spectrally distinct sets, or “regions,” allowing them to be individually identified by an xMAP® instrument. Each of these uniquely color coded beads has a unique 24 base DNA sequence, called an “anti-TAG,” covalently coupled to its surface. These beads enable you to quickly and easily design custom bead arrays simply by adding a complementary “TAG” sequence to your primers or probes of interest and hybridizing those primers or probes to the anti-TAG sequences on the addressable microsphere. MagPlex-TAG™ Microspheres are magnetic, allowing them to be easily separated from solution with the use of a magnetic separator. This improves percent recovery during handling and wash steps and facilitates assay automation. Additionally, MagPlex-TAG Microspheres are compatible with all xMAP® instruments, including the MAGPIX® system. MAGPIX is simple and easy to use, has a small footprint, and is the most economical multiplex instrument on the market. All microspheres are general use components for further manufacture of xMAP bioassays. MagPlex-TAG Microspheres are available at a concentration of 2.5 million beads/mL and can be ordered in 1 mL vial sizes only. Please contact Luminex to inquire about custom vial sizes. The MagPlex®-MixTAG80 product is a mixture of 80 (Group A & B) MagPlex-TAG Microsphere regions. This product is intended to facilitate the devel­opment of nucleic acid arrays with 80 or less targets. As each microsphere reacts only to nucleotides strands containing their specific complementary TAG sequence, unused regions in assays of less than 80 targets will not be detected by the instrument and not included in the resulting data set. 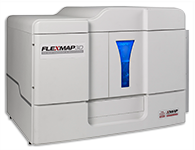 The MagPlex-MixTAG80 product is intended for Luminex® 100/200™ and FLEXMAP 3D® instruments running xPONENT® software only. Although the microsphere mixture can be used with the MAGPIX instrument, MAGPIX will only detect 50 of the 80 regions in the mixture. IMPORTANT: MagPlex-TAG microspheres require the use of xPONENT software. * MagPlex-TAG Group C regions are built-to-order. 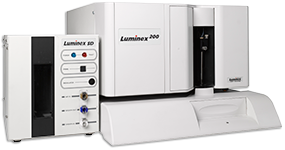 Please contact your Luminex representative to inquire about minimum order requirements and lead times for these regions. Most MagPlex-TAG Microsphere orders, 1 mL volumes, ship within three business days of order receipt. However, backordered items may have longer than normal lead times. MagPlex-TAG Microspheres have a maximum shelf life of two years from the date of manufacture. Group A and B regions have a minimum shelf life of six months from the date of shipment and Group C regions have a minimum shelf life of three months from the ship date. MagPlex-MixTAG80 has a maximum shelf life of 20 months and a minimum guaranteed shelf life of four months. Unfortunately, due to fluctuations in demand, it is not possible to guarantee a longer minimum shelf life for this product. Please see product part numbers below before placing your order, to see which regions are compatible with your instrument. 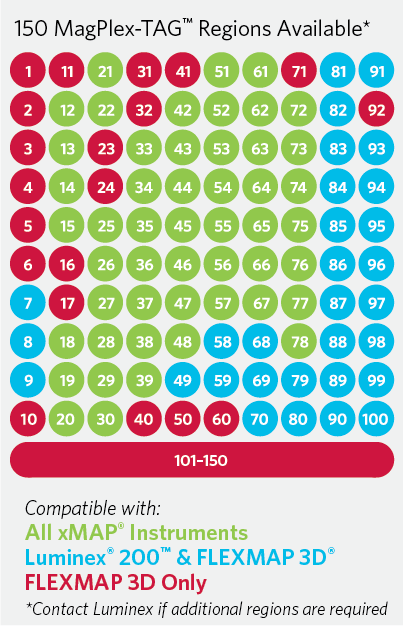 To ensure maximum compatibility and availability, new assay developers should always begin with the Group A regions, moving into Group B then Group C regions only when necessary for higher-plex assays. IMPORTANT: MagPlex-TAG Group C regions are built-to-order. 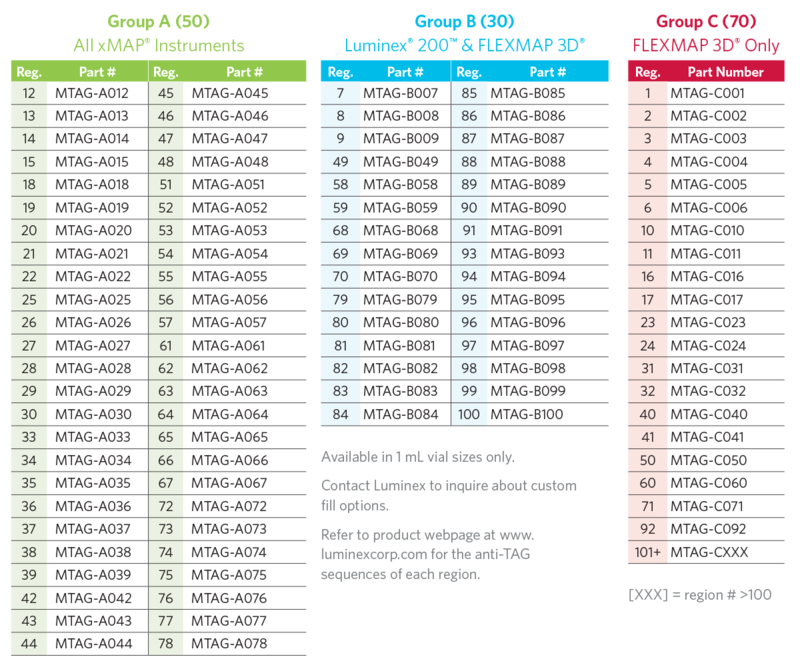 Please contact your Luminex representative to inquire about minimum order requirements and lead times for these regions. Available in 1 mL vial sizes only. Please contact Luminex to inquire about custom vial sizes.